Orthodoxy arrived in China in 1685, more than a century earlier than the first Protestant missionaries. Intermittent border skirmishes in the Amur River area between troops of the Qing Emperor and the Czar resulted in some Russians being taken prisoner. A priest by the name of Maxim Leontiev was among the prisoners taken in 1685 to Beijing. The Russo-Chinese accord of Nerchinsk in 1690 settled disputes but some of the released prisoners decided to stay in China as naturalized citizens. The Kangxi (Kang Hsi) Emperor gave a Guandi (Kwan Ti, the god of war) temple to them as a temporary place of worship in Beijing, and the Orthodox named it the Hagia Sophia Church. An icon of St Nicholas the Wonderworker was placed in the church, which was subsequently renamed the Church of the Dormition. The Emperor also gave Father Leontiev the title of an imperial official of the seventh rank. The Russian Government and Russian Church took notice of the Kangxi Emperor’s consideration. In 1695 the Metropolitan of Tobolsk issued documentation recognising the consecration of the Hagia Sophia Church and encouraged Father Leontiev to work for the spread of Orthodoxy, and to “pray not only for the Czar, but also for the Chinese Emperor”. Czar Peter I (“the Great”) was from the beginning an enthusiastic supporter of the Orthodox Church’s work in China. When Father Leontiev died, Peter the Great obtained the Kangxi Emperor’s consent for Archimandrite Ilarion Lezhaisky to take over in Beijing. The Archimandrite arrived in Beijing in 1715 with a priest, a deacon and other staff. 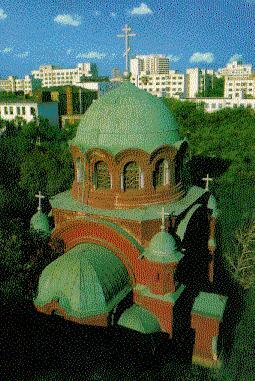 This was the first Spiritual Mission of the Russian Orthodox Church in Beijing. There were to be 20 tours, or delegations, of the Spiritual Mission in Beijing, from 1715 through 1956, when Archbishop Viktor returned to Russia following agreements reached between Nikita Khruschev and Mao Zedong (Mao Tse-tung). Throughout the period of the Czars, the Spiritual Mission worked closely with the Russian Government, often seeing a close relationship between the furtherance of Russian interests and Orthodox interests. In the first century-and-a-half of its presence in China, the Spiritual Mission did not attract a large following. It is said that in 1860 there were not more than 200 Orthodox in Beijing, including the descendants of naturalized Russians. In the second half of the 19th century, however, the Orthodox Church made bigger strides. The Spiritual Mission was blessed with scholarly and religious clergy. Numerous translations into Chinese of religious publications were made. By 1902 there were 32 Orthodox churches in China with close to 6,000 adherents. The church also ran schools and orphanages. The Boxer Rebellion of 1898 - 1900, an anti-Western and anti-missionary uprising in China, saw violent attacks on Chinese converts to Christianity. The Orthodox Chinese were among those put to the sword, and in June every year we commemorate the 222 Chinese Orthodox, including Father Mitrophan, who died for their faith in 1900 during the upheavals. After the Russian Revolution of 1917 the Orthodox Church in China lost its traditional support base and had to fend for itself. Any investments it made in the Czar’s bonds became valueless. However it became the spiritual home of large numbers of anti-Bolshevik Russians who left Russia for China, and the numbers of Orthodox in China swelled. By around 1930 there were more than 50,000 Orthodox in China, mostly Russians. Dioceses were established in Shanghai and Tianjin in addition to Harbin and Beijing. After the October Revolution the Orthodox bishops in China came under the jurisdiction of the Synod of Russian Bishops Outside Russia, convening in Karlovci, Yugoslavia, and subsequently in Munich and New York. The surrender of the Axis powers at the end of World War II gave rise to a change in the situation in the Far East, and the Moscow Patriarchate resumed jurisdiction over the episcopate in China in the late 1940’s. The Chinese People’s Republic was established in 1949 under the leadership of the Chinese Communist Party, which had close relations with the Soviet Communist Party in the 1950’s. Treaties were signed between the Chinese and Soviet governments which provided for the turning over of Russian churches to Chinese control. Archbishop Viktor, the last Russian bishop and leader of the 20th Spiritual Mission, returned to the Soviet Union in 1956, drawing to a close a variegated chapter in the history of Orthodoxy in China. After the communists came to power in China most of the Russians left for Australia, the United States and other places. 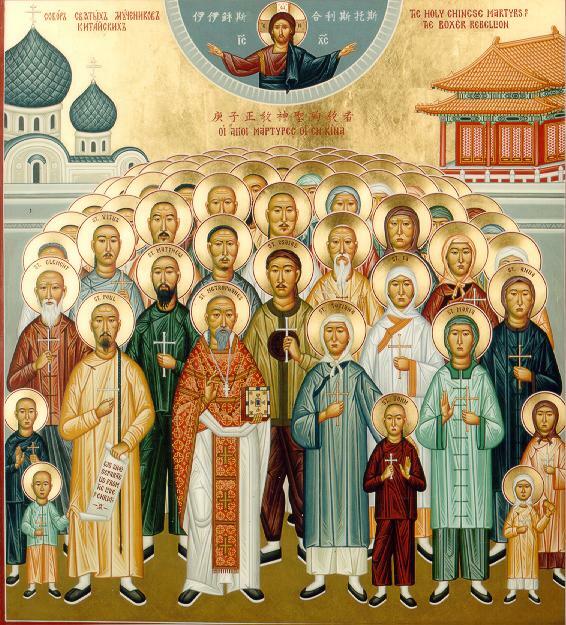 Now there are very few Russians left in China, and the numbers of the Orthodox from the old Russian-organised dioceses have dwindled drastically. There is only one functioning Orthodox church on the Mainland - the Pokrov church (the church of the Protection of the Theotokos) in Harbin. The resident priest, Father Grigori Zhu, is 75. There are about 18 parishioners who attend Sunday services, most of them elderly. The youngest is 65. Yet on the great feast of Easter this year, about 400 people filled the church - many who have settled overseas, and their children, returned to the mother church in Harbin for Pascha. Pascha is the central message of Christianity. God brings life out of death. What man or human organizations plan could never get around or defeat God’s plan. Perhaps there were people who expected, or even wanted, to see a dying Orthodox church in China. After 1997 this has totally changed. When we arrived in Harbin, we asked where we could find an active Orthodox Church only to learn that people only knew St. Sofia, now the museum of Architectural Art. Had Metropolitan Nikitas not given us the approximate address of the Church and Fr. Gregory’s name we probably would not have located either. The Holy Protection of the Virgin Church stands in the heart of the city at 270 Bolshoi Prospect, about a ten minute walk from the famous square with the figure of a snowflake. As we approached it we saw what appeared to be an administration building behind a small structure with a Russian three barred cross (picture). The administration building now houses a school for beauticians, a beauty parlor and barber shop. The church itself had workmen repairing the exterior. The gate to the street was locked. There were no announcements or signs to indicate that this indeed was an active church - very much in contrast to the Protestant church which was 150 meters away and was full of parishioners and had signs in Chinese and English announcing services. We walked a little further, but seeing no more churches in the vicinity we decided to return to the one under repair. When we asked for the priest, the workmen directed us to the school for beauticians. We thought this strange, but when we asked to speak with Fr. Gregory, we were pointed to the only door with no signs or advertisements. This is where Fr. Gregory lives and has his office. Fr. Gregory told us that he is 75, has family in Beijing, received his seminary training at the Russian Ecclesiastical Academy in Shanghai and began his priestly duties in Harbin in 1951. He stated that 140,000 Russians used to live in Harbin until the Communist takeover. Now his parish consists of 144 souls ranging in age from 68 to 92. On average, 18 come to liturgy on Sundays. On Pascha, over 400 people, mostly from towns accross the Russian border, attended services which are conducted in Church Slavonic. When asked about young parishioners or Chinese faithful he said that a young Chinese man, a student of Slavonic languages and a non-believer helps by reading the Psalms on Sundays. Because his church is undergoing capital repairs, Fr. Gregory indicated that his biggest need is money to pay for the church’s restoration. He has books and materials for church services, but money is the most difficult to raise. Former residents of Harbin, their children and grandchildren, come to visit from the USA and Australia. They appear to be the source of most donations. A former priest from Harbin, now a retired dentist in the USA comes to visit and has helped considerably. We hoped to attend Liturgy on Ascension Thursday, but Fr. Gregory said the next service would take place upon the re-opening of the church on June 20th. We asked whether one could go to another church. He answered that this was the only active Orthodox Church within the city’s limits. However, several years ago, the Chinese government built a church 1 ½ hours outside the city by taxi, but this was too far and inconvenient for the parishioners. Originally, a cemetery adjoined the church, but since it was located so close to the city’s centre, the government removed it to its present location and built the new church there.